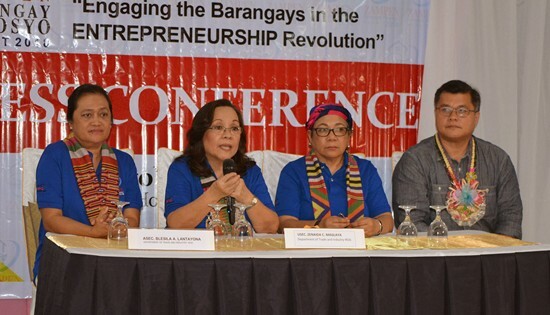 ZAMBOANGA CITY – Department of Trade and Industry Undersecretary Zenaida Cuison-Maglaya urged the barangay chiefs present during the Zamboanga Peninsula Barangay Negosyo Summit to look at entrepreneurship with developmental mindset to help their constituents in a long-term basis. Gracing the said event held last Monday in this city, Usec. Maglaya said, “Entrepreneurship can bring revenue to their barangay. They should look at this as a help to their constituents and the barangay as a whole. The jobs it will create and capacitating their constituents. Imagine our barangay officials who will not be pestered late at night by their constituents asking for emergency financial assistance because they already have money. They are now capable”. Maglaya said barangay officials should treat this initiative as a help in empowering the people, creating economic activity in the barangays, with them being partners of DTI and their constituents. “What we want is for our officials to look for those who are interested in entrepreneurship and who needs our help. They know better the people in their area. We, on the other hand, will come and talk to them and help them with their needs”, she said. Maglaya also pointed that with the surging prices of commodities, capacitating the public is essential. “There are things that are beyond our control, like the increase in prices. We need to capacitate our people; give them livelihood, or business with market for them to earn and help in the community. That’s what we want here. That’s what this partnership with our barangay officials is for”, Maglaya stressed. The Barangay Negosyo Summit is the first in the country, and was conceptualized and initiated by DTI-9. The summit’s aim is to invite all barangay chairmen in the region together with at least one micro and small entrepreneur in their area. Over 1,500 barangay officials and MSMEs attended the activity and was also graced by DTI, Department of Interior and Local Government (DILG), Department of Labor and Employment (DOLE), and other local governments and national line agency officials. Also present is Zamboanga City Mayor Ma. Isabelle Climaco-Salazar, who has vowed full support to DTI and DOLE in all its endeavors for the people of the city and the peninsula in general. CALBAYOG CITY – The Department of Public Works and Highways (DPWH) Samar First District Engineering Office (SFDEO) completes the construction of the access road leading to Mapaso Hot Spring in Brgy. Rizal II, Oquendo District, Calbayog City. The project has an appropriation of P30 million under the DPWH FY 2018 General Appropriation Act and is under contract with Victoria Development & Construction Supply Corporation. The scope of works involves concreting of 3-kilometre road, construction of 770 linear meters of drainage structure with concrete stiffener every 5 meters and slope protection of 1,379.94 square meters. This project aims to promote Mapaso Hot Spring as one of the frontier tourist destinations in the City of Calbayog, boosting economic activity beneficial to Calbayognons and to create a safer and more convenient road leading to the hot spring. With the realization of this project, convenience is elevated and travel time is cut in half from a 20-minute to a 10-minute ride boosting the expected tourist influx. On-going fabrication of reinforced concrete piles at Looc Bridge Almeria, Biliran for bridge widening project. 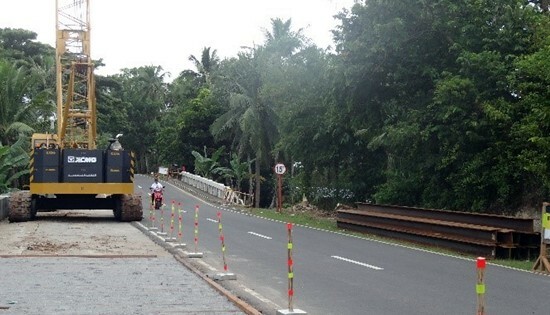 NAVAL, Biliran – The very first bridge widening project implemented by the Department of Public Works and Highways (DPWH) Biliran District Engineering Office (DEO) has started its construction at Brgy. Looc, Almeria, Biliran along Biliran Circumferential Road (BCR). Clearing of construction site is now on-going after mobilizing the equipments and materials for the said project. The widening of the P21.9M Looc Bridge involves the construction of two additional lanes of the bridge with a width of 3.66-meter, one lane on each side of the 24-meter length existing bridge. It was prioritized because the approach road of the bridge going to Kawayan, Biliran side was already widened. The said network development project is designed to accommodate more traffic volume and provide a wider and safer roads for the increasing vehicular users along BCR. When completed, at least 5,000 vehicular road users is expected to benefit on this project. According to District Engineer David P. Adongay Jr., this will be fast-tracked for completion before its expiry date on January 29, 2019. This is the second bridge widening project implemented in this province. The first bridge widening is Anas Bridge in Naval, Biliran which is presently implemented by the DPWH Regional Office under FY 2017 budget. In the photo are (from L to R): SB Corporation’s Head for Treasury Juliet Calimlim and Executive Vice President Melvin Abanto, Sec. Lopez, CARD MRI Founder and Chairman Emeritus Dr. Jaime Aristotle Alip, and CARD Inc’s President Flordeliza Sarmiento and Executive Director Jocelyn Dequito. MAKATI CITY – The Department of Trade and Industry (DTI) widens the reach of Pondo sa Pagbabago at Pag-asenso (P3) program with another P100 million loan fund for micro, small, and medium enterprises (MSMEs) following its renewed partnership with Center for Agriculture and Rural Development (CARD), Inc. (a microfinance NGO). The partnership between DTI and CARD signed through a Memorandum of Understanding (MOU) on 5 October 2018 will have an additional P100 million to the first P100 million allocated by CARD to augment P3 funds, for a total of P200 million-worth of loan funds now available for MSMEs nationwide. According to DTI Secretary Ramon Lopez, CARD – being the biggest microfinance institution – can be a credit delivery partner (CDP) that can reach areas not usually covered by other P3 CDPs. Sec. Lopez also expressed his appreciation to the group in supporting government initiatives to empower micro entrepreneurs, especially in the countryside. The loan fund is expected to benefit over 20,000 MSMEs, in addition to the current 41,800 MSMEs under the P3 program of CARD. The MOU also covered conduct of orientation, validations, microenterprise development trainings, livelihood, and financial literacy to clients. Currently DTI, through SB Corporation, has assisted 50,500 unique micro enterprise borrowers. The P2 billion loan fund will be fully downloaded to the MSME borrowers through CDPs by February 2019 and will benefit a total of 80,000 borrowers. In total, the partnership will be able to provide microfinancing assistance to over 140,000 MSMEs. QUEZON CITY – “Before the ‘Red October’ scheme was concocted by the military, the military and the police already had much time to practice their script-writing and story-telling stint through the filing of trumped-up charges against activists and critics. The formation of the Inter-Agency Committee on Legal Action (IACLA) is an extension of these imagined and supposed “crimes,” used to legitimize the criminalization of dissent. Ultimately, IACLA is an instrument of political repression,” said Karapatan Deputy Secretary General Roneo Clamor at a protest rally in front of Camp Crame in Quezon City on October 9, 2018. IACLA is a joint committee formed by the AFP and the PNP on October 9, 2017, exactly a year ago. 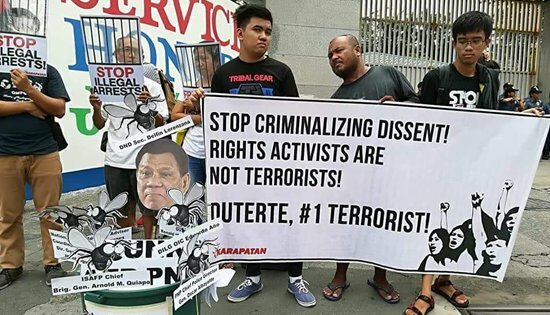 According to Karapatan, at least 221 individuals have already been filed with trumped-up charges since the start of Duterte’s term, and this has merely been aggravated by IACLA’s creation. Under IACLA, 178 individuals have already been arrested from October 9, 2017 to September 30, 2018. Clamor explained that IACLA is a revival of Gloria Macapagal Arroyo’s Inter-Agency Legal Action Group (IALAG), the agency responsible for fabricated charges against activists during Arroyo’s term. The IALAG was eventually abolished in 2009, after recommendations from UN Special Rapporteur on extrajudicial killings Prof. Philip Alston, but government policy and practice of filing trumped-up charges against activists continued under the Aquino regime and exponentially worsened under Duterte’s. “Truly, Duterte draws inspiration from fellow fascists whom he has shown utmost favor,” he added, citing cases of trumped-up criminal charges filed against development workers and trade unions organizers after the creation of IACLA. Benito Quilloy and Rita Espinoza, two development workers of the Assert Socio-Economic Initiatives Network (ASCENT) were forcibly taken by elements of the Criminal Investigation and Detection Group (CIDG) on October 19, 2017. The two were alleged as ranking members of the Communist Party of the Philippines (CPP) and were charged with illegal possession of firearms and ammunition, as well as other criminal offenses; the two have strongly denied the allegations. Quilloy and Espinoza are currently detained at the Butuan City Jail. Peace consultant Rafael Baylosis, trade union organizer Marklen Maojo Maga and public sector union organizers Juan Alexander Reyes and spouses Oliver and Rowena Rosales were illegally arrested this year. Baylosis and Maga were charged with trumped-up charges of illegal possession of firearms and explosives, with additional murder charges for Maga, while Reyes and the Rosales couple were also charged with illegal possession of firearms and explosives. Karapatan also reported that at least 128 peasants and indigenous peoples have been victimised by these trumped up charges, which the military and police use in an attempt to impede their defense of their right to land and ancestral domains. Clamor asserted that these cases are linked, and are by-products of IACLA, the regime’s counterinsurgency drive and its campaign against human rights defenders and political dissenters. “This is a systematic maneuver by the government to legitimize repression. It is the blatant subversion of laws, compounded by the collusion with the Justice Department, courts and other government agencies, to jail individuals and members of progressive organizations falsely labeled as “enemies of the State.” It is, put simply, the mobilization of State forces and resources to sow injustice,” he said. “We call for the immediate abolition of the IACLA and the withdrawal of all trumped-up charges against activists and progressives. We likewise demand the immediate release of all political prisoners. The Duterte regime keeps on adding to its list of repressive policies, and thus adds to the worsening rights situation in the country. This government is merely proving how hostile it is to resistance and dissent, even going to incredible lengths to discredit, silence, and persecute individuals,” concluded Clamor. BRGY. DAO, Oras, Eastern Samar – Eight (8) regular members of NPA, Nine (9) Milisya ng Bayan (MB), Twelve (12) members of Communist NPA Terrorist Mass base Organization or Underground Mass Organization of Brgy Boco, Can-avid, Eastern Samar voluntarily surrendered to the 14th Infantry (Avenger) Battalion, Philippine Army last October 01, 2018. These NPA fighters and the members of Mass base organization and Milisya ng Bayan of Brgy Boco, Can-avid, Eastern Samar surrenders due to hopelessness and frustrations over unfulfilled promises of their leaders and upon learning of the Enhanced Comprehensive Local Integration Program and other livelihood programs of the government. Lieutenant Colonel Jimmy V. Jimenez INF (GSC) PA, Commanding Officer, 14th Infantry Battalion, said that the surrender is a result of the on-going Community Support Program (CSP), enhanced civil military operations and intelligence operations being implemented by the unit in Barangay Boco – a known hotbed of communists insurgency in Samar Island. The mass surrender will surely destroy the chain of communists insurgents mass base support in the far-flung and isolated villages of the province. “Barangay Boco is categorized as influenced village since the year 2013 and form part of the Guerilla Base of the Communist NPA Terrorists (CNTs) roaming in the area of Can-avid and its nearby municipalities in Eastern Samar. The clearing of Barangay Boco is one of the focus and has been the priority of the 14IB as part of its operational campaign to achieve its mission in degrading the armed components of the NPA in our area of operation” Lt. Col. Jimenez added. CSP elements of Bravo Company of 14IB led by 2Lt. Dennis S. Carig (INF) PA were able to identify the members of the CNT mass organization and convinced them to end their support and break their ties with the NPAs. “The collaborative efforts of the CSP team with the LGU, NGAs and NGOs in addressing issues on poverty and land ownership further gained the support and trust of the villagers and encouraged them to pursue lasting peace to ensure development in their barangay” said 2nd Lt. Carig. In the conduct of peace rally, the people of Boco expressed their stand against the CNTs, condemned the abuses and deceitful activity of the NPA and call-out to stop using their Barangay as lair of insurgents. Lt. Col. Jimenez also added that “The 14th Infantry ‘Avenger’ Battalion will continue to be relentless in the conduct of military operation to degrade the capability of the NPA rebels that continuously pestering and terrorizing the people of the towns of Can-Avid, Oras, Dolores, Arteche, Jipapad, Maslog and San Policarpio. However, we are always ready to receive those NPA members and their supporters who are willing to go back to the folds of the law and live normal lives with their families”. David P. Adongay Jr., (wearing jacket) District Engineer inspects on-going construction of Caraycaray flood control structure project in Naval, Biliran. 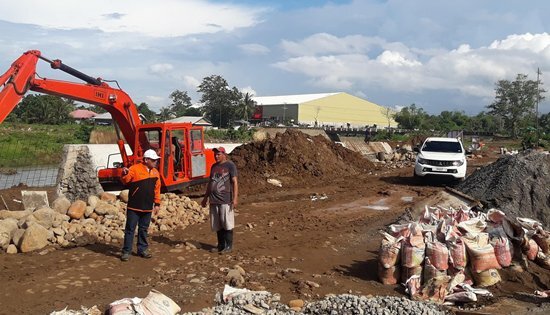 NAVAL, Biliran – The Department of Public Works and Highways (DPWH) Biliran District Engineering Office (DEO) is urging contractors to fast-track the implementation of projects to meet the district’s physical target accomplishment. David P. Adongay Jr. District Engineer expressed his disappointment on the low performance of the district office for the month of September, 2018. According to Adongay, Biliran DEO placed number 12 out of the 13 performing districts in Region VIII for the said month. As of September 31, 2018, the district has reported a negative slippage of .70% and has an overall accomplishment of 59.69%. Adongay emphasized that the physical accomplishment of the district from August to September, 2018 just increased to only .06% when it is supposed to increase at least 15% each month. The district engineer is strongly asking for cooperation from the contractors to help Biliran DEO accelerate its project implementation. “Hindi ibig sabihin pinabibilisan ang projects, macocompromise na ang quality,” Adongay said. Adongay also orders project engineers to closely monitor their projects from time to time. In order to patch up the negative slippage and low accomplishment of the district, Adongay strictly orders project engineers not to approve any time extension or suspension requested by the contractor. Under 2018 project implementation, Biliran DEO has a total of 60 projects. As of September 31, 2018, 31 projects are already completed, 26 are on-going and three are not yet started. Some of the big ticket projects are still on-going or just started, hence the low performance. The district has completed four rehabilitation of bridges, two asphalt overlay projects, two access road projects leading to trades and industries and economic zones and 17 flood control projects under its 2018 regular infrastructure project implementation. 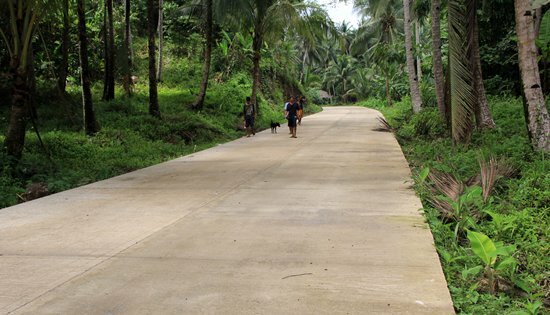 While under 2018 local infrastructure project implementation, Biliran DEO has completed three multi-purpose buildings, one flood control project, one Farm-to-market road project, and one road widening project. QUEZON CITY – The Duterte administration resorts to troll-like comments in trying to invalidate the student movement. Philippine National Police (PNP) Chief Albayalde had the audacity to call out free education beneficiaries who are vocal and protest on Oplan Tokhang, Oplan Kapayapaan, Martial Law in Mindanao, sky-rocketing prices of basic commodities caused by the detested TRAIN Law, and policies that caused suffering on the Filipino people. State scholars owe their free education to the Filipino people and not to this arrogant government. Hence they are expected to stand with the oppressed majority who suffer from the policies of the state. We believe that real education should remove our blindness to the social realities around us. Education is meaningful only if we use it to advance the interest of the exploited and promote genuine social change. Albayalde boasts of free education as if it was given out of Duterte's generosity, stealing the credit from the decades-long struggle of the youth for their right to education. It must be noted that the Duterte regime tries to take back free education from the youth through maneuvers like impending budget cuts, stricter admission and retention policies, and the continued privatization of the country’s education system. To cripple activism among the youth, the regime exacerbates the attacks on students' democratic rights. No wonder Duterte, the military and police are trying to attack the freedom to express and organize in schools. The state advocates against critical thinking among students and teachers while it actively spreads fake news, fictitious plots, and other forms of disinformation. Using the no-fee-collection policy to its advantage, the Duterte regime blocked student councils and publications from collecting funds from their fellow students, disabling their operations that ought to promote student interests. Also, the right to organize will be trampled upon by exaggerated monitoring and intelligence networks planted by the state within schools. Duterte, AFP and PNP must be reminded that the allegiance of the Filipino youth is to the Filipino people, not to this mad tyrant Duterte. He should have learned from history that Filipinos do not tolerate dictators. We are honored to be tagged as enemies of the Duterte regime at the forefront of this struggle, no matter the gravity of the reactionary state’s efforts to put out the blazing resistance of the youth. Five anti-personnel mines seized during operations of 87th Infantry Hinirang Battalion. POLANGI, Calbiga, Samar – The 87th Infantry (Hinirang) Battalion seized five anti-personnel mines in Brgy. San Mauricio, Calbiga, Samar yesterday. The 87IB conducted strike operation on one identified Communist Terrorist safe house that resulted in the discovery of the newly made anti-personnel mines. The safe house is under Sergio Rodante Ortiz Command, South Samar Committee Sesame, EVRPC. The explosives are contained in a cylindrical type can, four of which are estimated to be five kilograms each and the other is estimated to be two kilograms. The discovery of anti-personnel mines saved the lives of the innocent civilians and their properties. It has been noted that the use of personnel mines has been banned by the international community. The Communist Terrorist has proven again that they will do anything to achieve their selfish desire even if it means endangering innocent civilians around. “We will not allow any terroristic acts in sowing fear among the local populace of Calbiga, Samar, I encourage the remaining members of the Communist Terrorist to lay down their arms and avail the Enhanced Comprehensive Local Integration Program of the Government,” says Lt. Colonel Rommel R Cabanayan, Commanding Officer of 87IB. 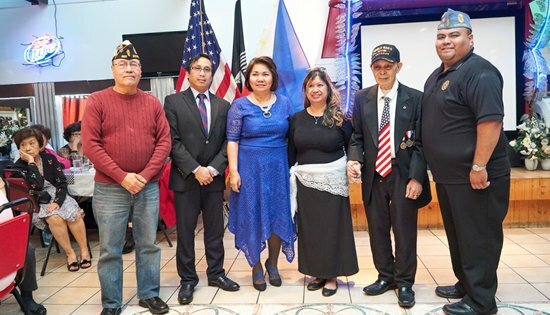 CHICAGO – The Filipino American Veterans of Illinois (FAVI), with its membership recently receiving the award of the US Congressional Gold Medal for their assistance during WWII that led through the horrific Bataan Death March, sponsored an Annual Tribute of Remembrance just days ahead of Philippine American History month in the US. In collaboration with representatives from various groups of the Filipino community and from local veteran organizations, family and supporters gathered in a local restaurant, on Saturday, September 29, 2018 to once again pay tribute in a solemn ceremony to FALLEN US Army Soldiers and local Balangiganons who fought in the conflict on September 28, 1901 during the Philippine American War. The ceremonial program included the Roll Call of the Fallen forty-eight Soldiers of Company “C” US Army 9th Infantry Regiment, a reading of names from a list personally supplied by Ms. Jean Wall, daughter of survivor Army Private Adolph Gamlin. Then the twenty-eight names of local townspeople (Balangiganons) supplied by current Mayor of Balangiga Randy Graza were sounded off. Following after each of the names were read a ringing from the striking of a bell in the distance, a total of 76 soft chimes in all could be heard. The annual event held in Chicago since 1999 is the only program of its kind in the US which properly pays tribute to the fallen. We emphasize that this is not a celebratory event that pays honor for their acts of service that led to this encounter. We have done this in Chicago without church bells, commemorating all those that had fallen from both sides, since the conflict for the Town of Balangiga, during the Philippine-American War. While in other areas the memories of the fallen have remained idle by those who have claimed property of these church bells. Malacañang Palace in a letter called upon the Philippine Consulate Chicago to represent the President of the Philippines. In attendance was Consul General Gina A. Jamoralin shared her remarks highlighting the brave Filipinos who gave of self for freedom, not being able to rewrite history but to learn from it, continued close alliance with the US noting the support of its people during WWII. ConGen Jamoralin also mentioned the daily contributions of Filipino Americans across the US as they begin to celebrate the upcoming month of Fil-Am history. Most importantly she wished to thank, and pass along the well wishes of President Duterte and DFA Secretary Cayetano to US-DOD Secretary James Mattis, for his recent intervention and tiresome support to secure from the US Congress, approval to repatriate the safe return of the bells from which they came, the church of San Lorenzo de Martir in Eastern Samar. The FAVI group has been a staunch member of the Veterans Assistance Commission (VAC) of Cook County, a coalition of veteran organizations for nearly two decades and supporter of most veteran related issues. Our gratitude is owed to the Lions Club, Chicago Nightingales, Vietnamese Community of IL, the American Legion, and Chicago MARINES for their continued support in preparing this annual tribute to all who gave the ultimate sacrifice that early September morning. A special note of appreciation is extended to Malacañang Palace, the Dept of Foreign Affairs and the Philippine Consulate Chicago.